Biomass energy processes can be better appreciated once you understand what biomass energy is and the goals in creating it. By definition, biomass energy is created by the burning (combustion) or biochemical conversion of any organic matter to be used for fuel. Some of the organic materials used as a source for biomass energy include wood, sawdust, grasses, corn, sugarcane, farm waste (cow manure), and other plant life. 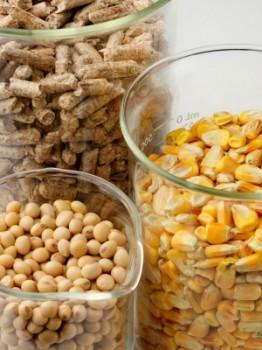 The processes for converting biomass into energy are numerous. The most well-known process is simple. It is burning (combustion). The combustion process generates heat that's transformed into energy. In the combustion process biomass is burned and converted into energy. The advantage of biomass combustion is that you can use the heat without needing to convert it into another form of energy such as electricity. You simply use the heat directly for such things as heating your home and heating the water in your home. In addition, the combustion heat can be used for direct heat in plants, manufacturing facilities and even office buildings. Direct heat can also be converted into electricity. The co-firing process is considered an inefficient method of combustion. In this process, the biomass replaces anywhere from 15 to 20 percent of the coal used in a power plant. This helps to reduce the emissions from coal fuel and even reduces the operating costs. Switchgrass is the most common material used for this process. Switchgrass is a perennial summer grass that's a natural plant found in the American Great Plains region and in some areas of the South. It's a strong resistant plant that can withstand drought, flood, pests, and poor soil. It's a resilient crop that can also be cultivated without the need of harmful fertilizers than can result in runoff pollution into the rivers, streams and oceans. Many scientists believe that switchgrass is a more efficient feedstock for ethanol production than corn. The combustion process produces some air pollution and isn't as efficient as other methods since a large portion of the energy produced escapes. The gasification process takes place by using high temperatures and controlling the amount of oxygen and steam when converting carbon materials such as petroleum, coal, biomass, and biofuels into hydrogen and carbon monoxide. This conversion process produces what's known as syngas and is a more efficient product of biomass than the combustion process. Syngas can be burned directly, used to create methanol and hydrogen and even be further converted into a synthetic fuel. You may be familiar with current gasification processing of fossil fuels. Pyrolysis occurs when biomass is heated without any oxygen in the chamber. Water, charcoal, tar, oil, and gases such as hydrogen, methane, carbon dioxide, and carbon monoxide are the products of biomass pyrolysis. These chemical changes are determined by the type of biomass being processed and how long it takes to heat. Charcoal is the most common end-product created from pyrolysis processes, which is used in metallurgy for absorption applications. The torrefaction for biomass production is a thermo-chemical processing by the use of heat. The required temperature for this process is between 200 to 320 degrees Celsius. During the process oxygen is removed and any moisture in the biomass is removed, leaving what's termed as volatile matter. Superfluous volatiles are also removed for a purer form of useable biomass. Superfluous volatiles can include cellulose and other biopolymers that give off an array of volatiles as they decompose. The result of this process is a dry dark solid biomass that's known as bio-coal. The bio-coal is typically made into pellets or briquettes and burned for heating in homes and fuel for industries. Bio-coal has less smoke than other combustibles. There are other processes for converting biomass into energy that don't require burning. These methods are able to convert biomass materials in the raw and turn them into various forms of solid fuel, gas and liquid. The power plants are then able to use these converted energies, directly without any further processing. Because most of the biomass has ample carbohydrates, they can be reduced to several different chemicals that are considered viable fuel sources. Corn, sugar cane, soybeans, and other renewable plant life can be converted into liquid forms as fuels and used in place of diesel and gasoline. Cooking oils are often collected from restaurants and recycled into biodiesel. The non-combustion of plants requires heating the plants in an effort to break down the chemical structure of the plant. These chemicals are solid, gas and liquid. Some of these chemicals can be used directly, while others need to be broken down further through other refining methods. For example, to use methane requires a biomass gasifier to extract the methane by forcing the plants to release it. The methane is then used in gas form to power the turbines that produce electricity. Methane is also converted into a hydrogen fuel that's used to generate electricity with very low emissions. It may sound odd since fermentation is mostly associated with making liquor, beer and wine, but it's a logical way to convert bioenergy. It's through a fermentation process that corn is turned into a grain alcohol (ethanol). An offgas of this process is methane, which can be used for electricity production. Biomass fuel, such as ethanol can produce around five times the energy put into making it, which makes it an economically sound energy source. The downside is that the farther the fuel has to be shipped, the less economical it becomes. Therefore, the value of biomass energy processes is when the biomass is used where it's produced, such as on farms and immediate communities.